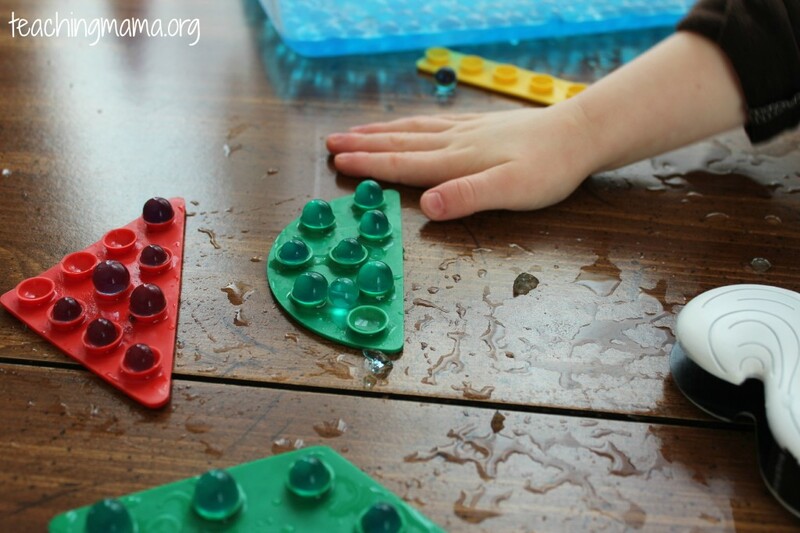 We love playing with water beads and the kids are always thrilled when I get the water beads out. 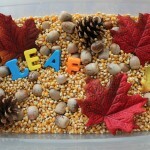 Today we not only played with them, but we used them for a fine motor activity. Wes was in a trance as he played. 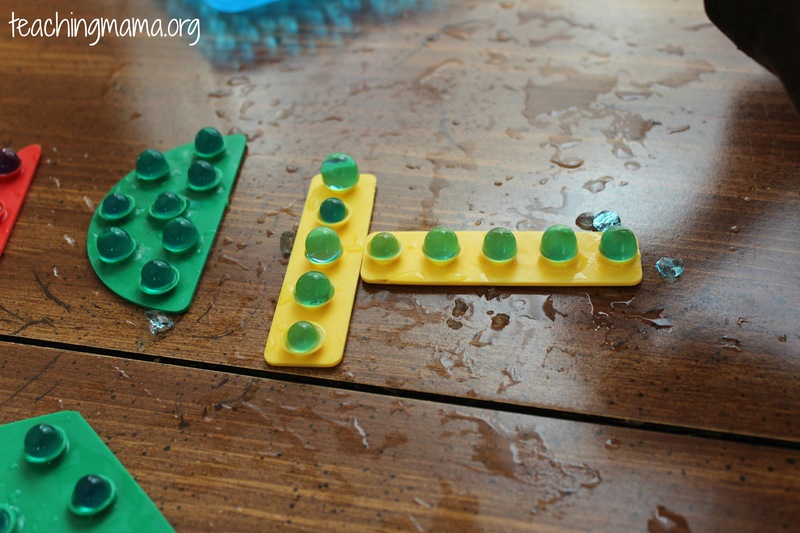 For this activity, I used our Discover Toys bath shapes. 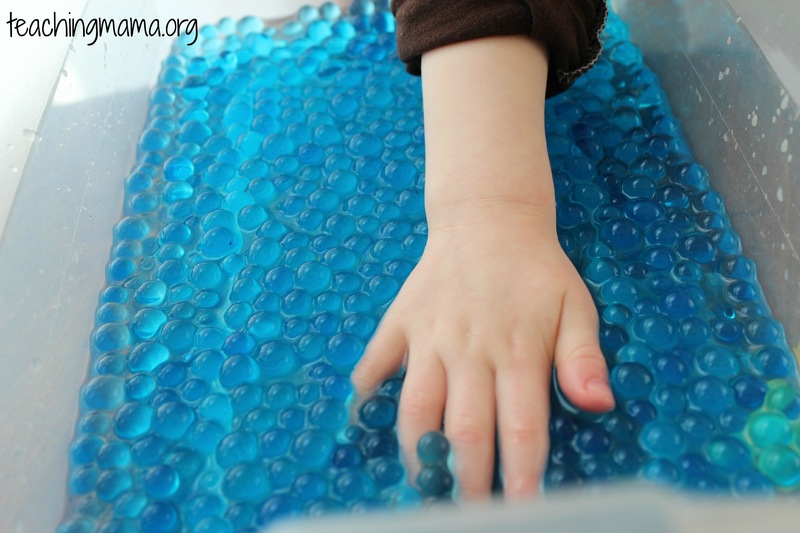 They have suction cups on the back, which are perfect for holding water beads. 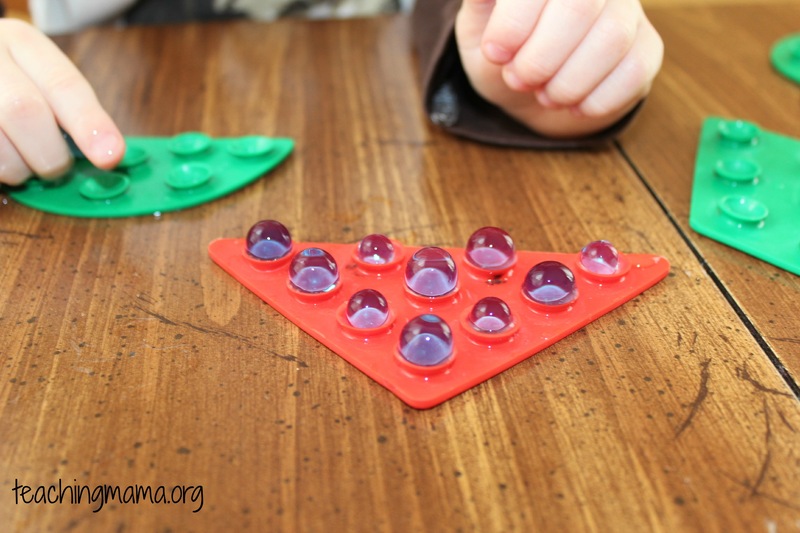 I laid the shapes in front of Troy and had him take water beads and put them in the suction cups. 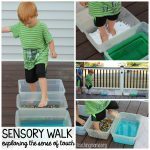 Since they are slippery, he had to practice using good control with his fingers and concentrate on getting them in the suction cups. As you can see, we had some excess water from the beads. 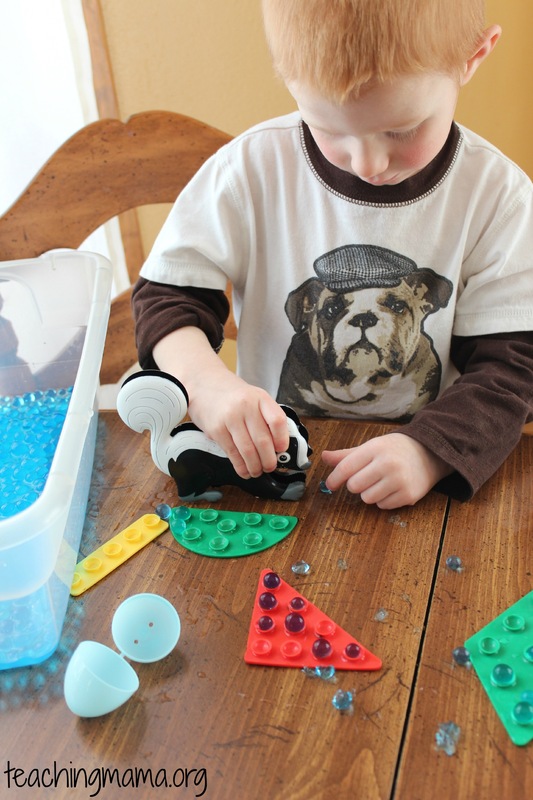 We tried using our skunk tweezers to pick up the beads. 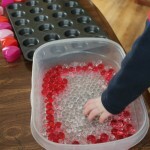 It was tricky since they are slippery and squishy. Troy got it a few times. Lastly, we made a ‘T’ for Troy! I looked at Discovery Toy’s current catalog and they no longer sell these. If anyone knows where to buy these or something similar, please share! These look amazing! I’m going to try to find a set. Great! Let me know if you find one! Hi Jessica! You can find them at Michael’s Craft Store or Walmart in the floral section. They come in packets that look like seeds. You take the seeds and put them in lots of water. 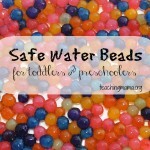 Overnight they change to water beads. You can also buy them already made at the Dollar Store in the floral section. Hope that helps! Cool idea! 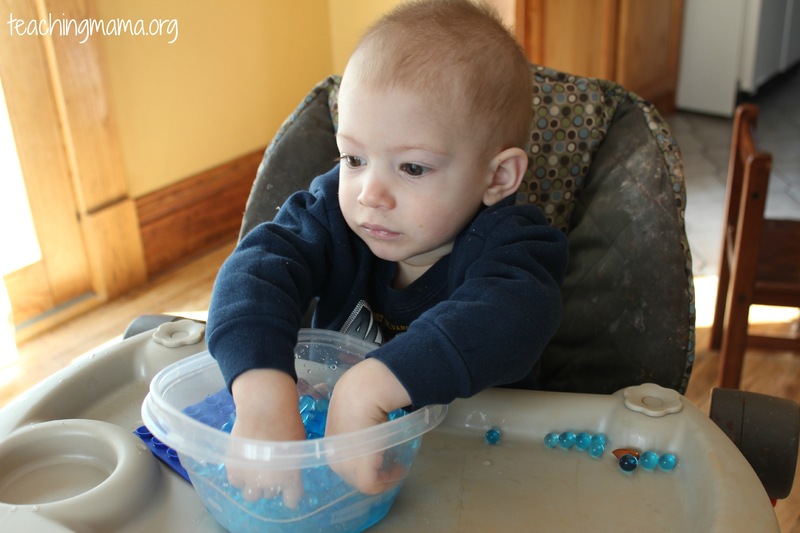 We also love water beads 🙂 I will have to pull our tweezers out today to have little one try to pick up the beads with the tweezers. Thank you. Let me know how it goes!! 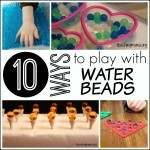 I have not heard of water beads I guess. I was thinking along the lines of marbles, but then one of your pictures some look broken apart. please tell me more about them. 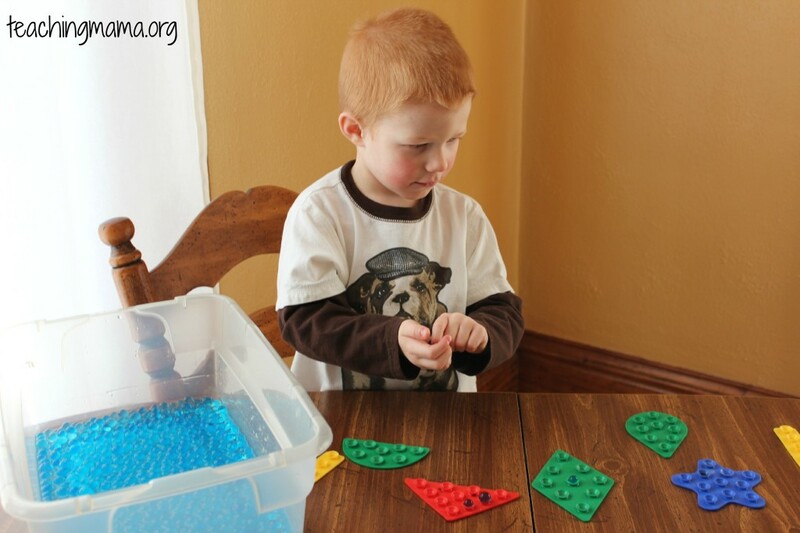 Debbie – Water beads are the same as “aqua beads”. You can buy them at any dollar store in multiple colors. They are primarily used for plants. People buy them to put in glass jars to keep flowers and such hydrated. At the dollar store that I buy them at, they are in the aisle with glass jars and the green foam blocks that people use for plants. Hi Debbie! Cheryl gave a wonderful explanation of water beads. 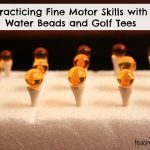 They are mostly used with vases and flowers, but kids love playing with them! They are soft, squishy, slimy, and bouncy. We buy ours at the Dollar Tree and Michael’s Craft store. Hope that answers your question! Do you know where can I buy something similar to your bath shapes? Discover Toys seems not to sell them anymore.